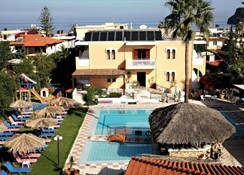 Located in Agia Marina area, Canea Mare Hotel And Apartments offers accommodation with balcony or patio within 50 metres from the beach. 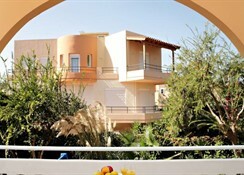 Featuring a swimming pool with sun terrace and 2 bars, the property''s public areas enjoy free Wi-Fi access. 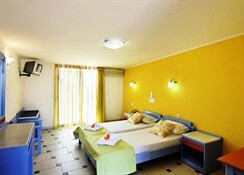 Canea rooms are bright and tastefully decorated in yellow and green details. Each air-conditioned unit is equipped with a TV and a fridge. Some units also include a kitchenette with dining area. The hotel’s snack bar serves drinks and cocktails until late at night, while there is also poolside snack bar. 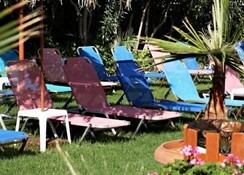 Canea Mare Hotel is a modern, newly renovated and beautifully designed, three star hotel - with spacious rooms and apartments arranged on two floors.The hotel is family owned and run, with a friendly staff ready to serve you at any point of the day. The apartments at Canea Mare have been recently renovated to offer all customers additional luxury and comfort during their stay.They are fully furnished and tastefully decorated, for comfortable holidays - family or individual - in a very cozy, family environment.The apartments are separated into 2 different categories.One bedroom apartments:- a separate bedroom and sitting area for 2-4persons. 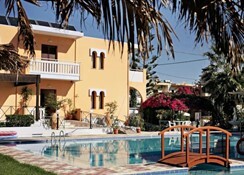 A comfortable family size apartmentfully furnished and equipped.- 2 single beds and two sofa beds- television- direct dial telephone- radio- kitchenette / refrigerator- private bathroom (with shower)- A/C (extra upon demand)- Safe Box (extra upon demand)- All rooms have a large balconyHotel Rooms:- comfortable rooms for 1-2 persons- 2 single beds- television- direct dial telephone- refrigerator- private bathroom (with shower)- A/C (extra upon demand)- Safe Box (extra upon demand)- All rooms have a large balcony.